Johnny Green and His Orchestra (Warner Bros., 1935). 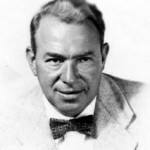 Musical short subject featuring composer Green leading his orchestra through several of his own songs, including “How Can I Hold You Close Enough?” with lyrics by Yip and Edward Heyman. Part of Warner Home Video’s Errol Flynn Signature Collection: Vol. 1, it is part of “Warner Night at the Movies: 1935” an extra included with feature Captain Blood.